I haven't done any art in awhile, but J asked if I could create a dinner party invite crest for him, so I spent a study break doodling. I've recently been obsessed with vintage flatware, so I used it as a framework. 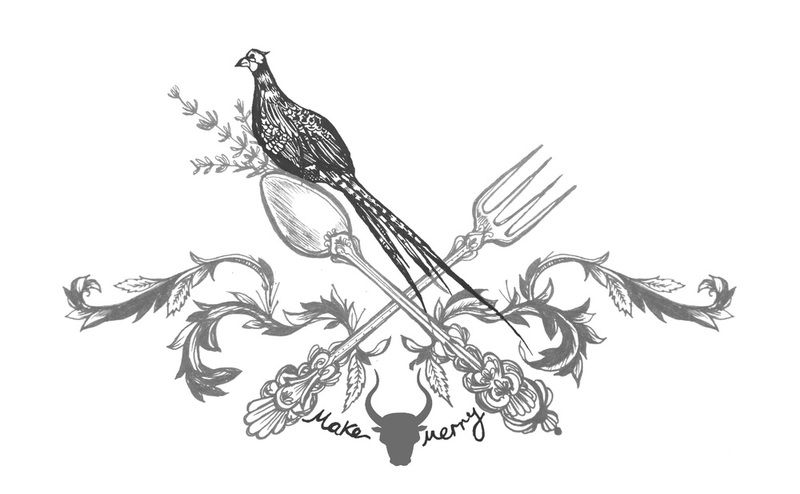 Next, I needed two tasty animals to sit on the crest, but I wanted something more exotic than a chicken and cow, so I decided to work in a pheasant and a bull. I love how distinct the tail feathers of a pheasant are. I added some random herbs to fill space in the crest, but J found my choice of chervil too feminine. He kept the thyme and mint though. Finally after photoshopping for symmetry, I gave him a working prototype to play with so he could pick the colour and shading for himself. I'm curious to see what he'll pick in the end.